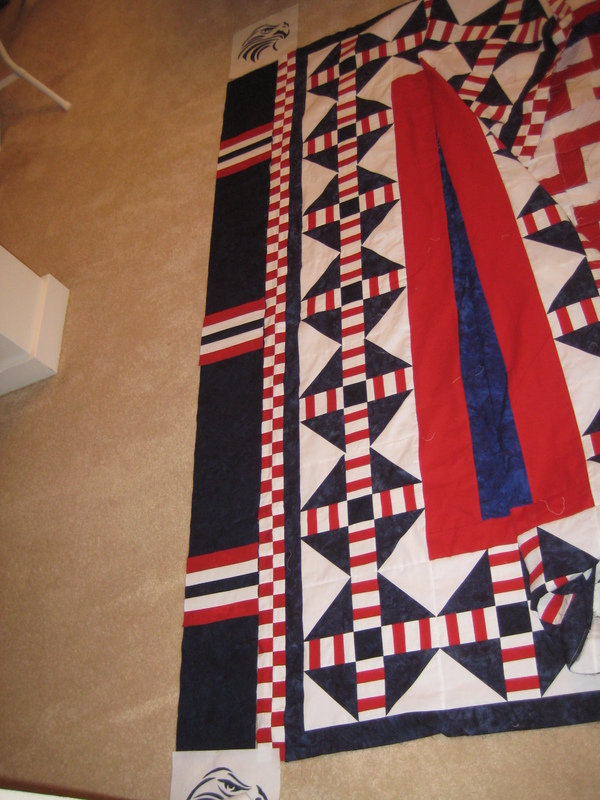 I am doing the final border on a quilt I am donating to the VFW for a raffle. I have the corners of an eagle head done, but I am stumped on what to do between them!! Any ideas - pictures would be great - from you would really help me!! 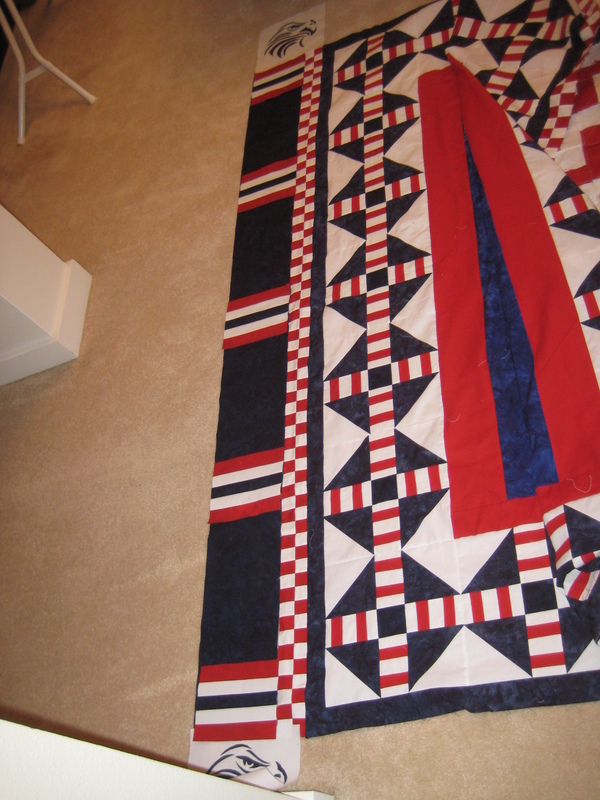 You have an awesome quilt design and there is so much going on I would use solid navy between your strip sets in the border to draw a continuous line to each Eagle head. It is a gorgeous quilt and will raise a good amount for a great cause. Oh thank you, Cybrarian!! What about changing the strip sets to be red, white, blue, white, red with the blue in between??? Thats exactly what I was going to suggest! If it were mine... I'd leave the red-white-blue strips by the eagle heads. Then put navy blue between. Gives your eye a chance to rest and see all the beautiful work that's there. That is a very pretty quilt and design. Please share when completed! I would also go with the navy. Great quilt! I like the suggestions to use dark blue and to alter the narrow strips in between. That would border the eagle blocks with same color on both sides, to further enhance them. Its a great quilt design, love it. You created a great quilt! I recognize the eagle head from some of the clip art I was looking at. Wonderful idea! OK, which border do you like best? I have two borders to choose from - one with 3 RWBWR strips and one with 5 RWBWR strips...which one do you think would be best for this quilt? I like the three. It gives more attention to the center of the quilt. Very nice either way. Ditto to what Cybrarian said...you did a fantastic job and should be very proud. I agree, I like the 3 better. 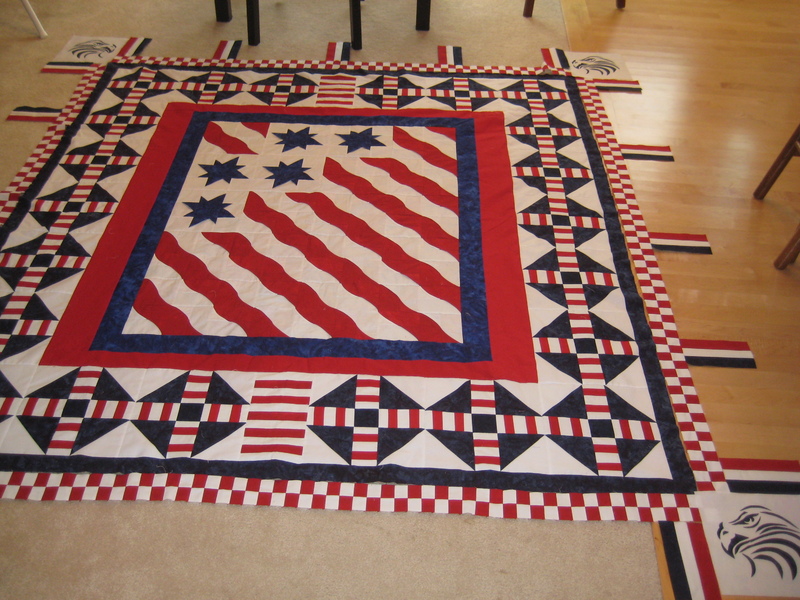 It adds to the quilt but still keeps the focus on the beautiful work you have done with the flag and eagle blocks! i agree with everyone's suggestions. Gorgeous quilt! I would quilt stars in all that solid blue!